A 2-year-old boy was brought to a family practice office by his mother for a follow-up visit. In the emergency department, the child received treatment for a friction burn to his right hand after he got it stuck in a moving home treadmill. The patient unintentionally wedged his hand between the moving belt and the support bar at the rear end of the treadmill. His mother, who had been jogging on the treadmill at the time, disconnected the safety key, but not in time to prevent the injury. The treadmill had safety instructions located on the underside of the machine and were, therefore, not visible to operators. Search “Treadmill” on YouTube.com and the first few results are likely videos of teenage kids playing foolishly on gym equipment. While shocking, the videos are highly representative of how dangerous an improperly-operated treadmill can be. According to data provided by the US Consumer Product Safety Commission, more than 8,700 children are injured by exercise equipment every year. Many of these injuries are due to stationary exercise bikes, but treadmills represent a growing portion of total injuries. The three most common injuries reported were contusions, lacerations, and burns. Ensure that children never play on or near exercise or weight training equipment. Install barriers that prevent children from wandering into a room with exercise equipment. 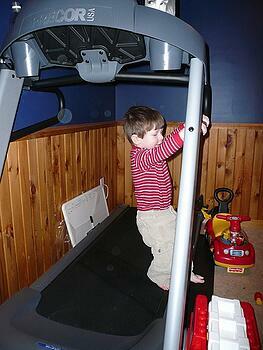 Teach children that treadmills are fast-moving and are not toys. Locate and use any auto-shutoff features that may exist. Adults are just as susceptible to serious treadmill injuries as children. Adult injuries are typically caused by deficient knowledge of the functions of the particular machine. From heart monitors to programmable routines, treadmills have become increasingly complex, and several advanced features can make operation overwhelming. When televisions, headphones, and magazines are added to the equation, it’s shocking more accidents don’t occur. Distractions, complexity, and exertion combine to set the stage for a potentially devastating trip and fall exposure. Most serious treadmill accidents involve excruciating friction burns. If a trip-and-fall accident occurs, having plenty of clearance behind the treadmill becomes very important. If placed too close to a wall or other equipment, an exerciser may become trapped and the moving treadmill belt can grind away at exposed skin. These devastating injuries can require costly skin grafts and a comprehensive rehabilitation regime. Accidents will happen, but these precautions can minimize the exposure. Paint two brightly-colored stripes width-wise across the treadmill belt. A sizeable portion of treadmill accidents occur because the patron does not realize even the machine is moving. Recognizing the sound of a moving belt is difficult in a busy exercise room with several machines in use. Follow manufacturer guidelines closely. Keep all exercise machines well-maintained. Unplug, document, and clearly publicize any defective treadmills. Offer orientation opportunities for all clients. Clearly explain all major functions of the equipment and acquire documentation of a completed orientation. Keep a minimum of 4 feet open behind the treadmill to prevent members from being trapped and burned. Consider using surveillance equipment. 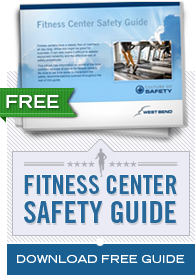 Surveillance of all exercise equipment can be an invaluable resource if an accident does occur. Footage of the incident can help you prevent other injuries and protect yourself from potential liability claims. Even if preventative steps are taken to minimize the risk of a treadmill injury, accidents can still happen. The steps you take following an accident can heavily impact your potential liability and help ensure similar accidents do not reoccur. How did you fall? Did the machine malfunction or did you trip? What speed and height settings were being used? Were you wearing the auto-stop device? If so, did the machine shut down after the fall? Survey the area and document any observations. Take photos if necessary. Were proper shoes worn by the patron? Were guidelines and/or signs indicating proper use clearly visible? How many associates were on duty, and were they available for assistance? If you suspect the accident was caused by a malfunction, DO NOT dispose of the treadmill. Move it to a secure location if possible. Unplug it and clearly indicate that it is out of order if it cannot be moved easily. Maintain copies of incident reports and photos. This information may be needed several years down the line.